Apple is also rolling out two new original TV series, a long-form version of James Corden’s Carpool Karaoke segments from the “Late Late Show,” and reality TV-type series called “Planet of the Apps.” But neither series is being launched under the Apple TV banner. Instead, as Apple content chief Eddy Cue explained at the Code Media conference this week, both will be made available through Apple Music in a bid to boost subscriptions to the music streaming service. If there’s a strategy here it’s well disguised. The problem starts with Apple’s device-centric approach. Ever since Steve Jobs introduced his “hobby,” Apple has tried to re-engineer the TV viewing experience through better hardware. Over the years it has held talkswith pay-TV operators about replacing their own set-top boxes with Apple TVs and letting Apple redesign their UIs. When those talks foundered on operators’ fear of letting Apple get between them and their subscribers Apple held talks with media companies about assembling its own, skinny subscription bundle of channels for Apple TV. When those talks stalled over disagreements on price and the configuration of the bundle Apple declared that apps are the future of TV and added an app store and Siri-like voice control to Apple TV, essentially turning the set-top box into an oversize iPhone tethered to a big-screen television. Meanwhile, the television ecosystem has been evolving away from fixed platforms and tethered devices. Netflix proved that you can build a TV empire on the backs of other people’s devices, to the point where the incumbent pay-TV operators eventually feel compelled to integrate with your own delivery platform. Amazon is building its TV empire on a combination of its own devices and others’ and bundling it with other services. Any hope Apple may have held out for getting help from the government died last month when Ajit Pai was named chairman of the Federal Communications Commission and moved immediately to kill his predecessor’s plan to force pay-TV operators to “unlock” the set-top box and allow third-party device makers like Apple to gain access to their content, as Apple had once tried to negotiate on its own. The biggest threat to Apple’s long-term TV ambitions, however, assuming it really has them, is from the wireless carriers, the very service providers Apple once shoved aside by establishing its own billing relationship with iPhone users. As discussed here in a previous post, AT&T, Verizon, and T-Mobile are all building out mobile-first video and TV platforms, bundled with data, in anticipation of the day when 5G technology allows them to deliver robust TV service wirelessly into the home. As I’ve argued before, mobility and wireless delivery are the keys to overturning TV’s ancien regime. And Apple, ironically, should be well-positioned to storm the castle. It owns one of the two dominant mobile computing platforms in the U.S. in iOS. 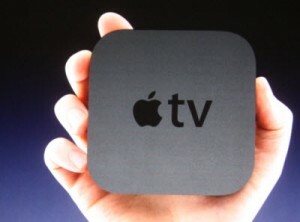 The current generation of Apple TV even runs a version of iOS called TVOS, which at first appeared to be effort to turn Apple TV into merely the in-home outpost of a mobile-first video platform. But Apple has done relatively little since then to encourage programmers and developers to create the sort of integrated experiences that might have differentiated Apple TV from Roku boxes, game consoles, Amazon Fire, or any of the myriad other ways consumers can stream content to the TV. Instead, to the extent Apple has focused on Apple TV at all it has stuck stubbornly to trying to engineer a new TV experience into the hardware itself. They may fit Apple’s hardware-centric business model. But it isn’t likely to be a winning strategy in the wireless, cloud-based, and mobile-driven future of TV.